Huan (S. ‘Mighty hound’), the Hound of Valinor, was the noblest dog to ever walk in Middle-earth. Originally the hound of the Vala Oromë, he had been passed on to Celegorm, who brought the hound with him to Middle-earth. For hundreds of years, Huan faithfully served his master, falling under the Doom of the Noldor, which prophesied that he would die at the jaws of the mightiest wolf in Arda. Following the imprisonment of Lúthien by Celegorm and Curufin, Huan abandoned his master and helped Lúthien to escape and make her way to Beren. In Tor-in-Gaurhoth, he slew many foes – among them the werewolves of Sauron, their leader, Drauglin, and Wolf-Sauron, who sought to fulfill the prophecy (though he was not the mightiest wolf in Arda). Beren and Lúthien returned to Doriath while Huan returned to his master, where he learned of the exile of Celegorm and Curufin from Nargothrond. When Curufin tried to kill Lúthien, Huan turned against his master, defending her and Beren. 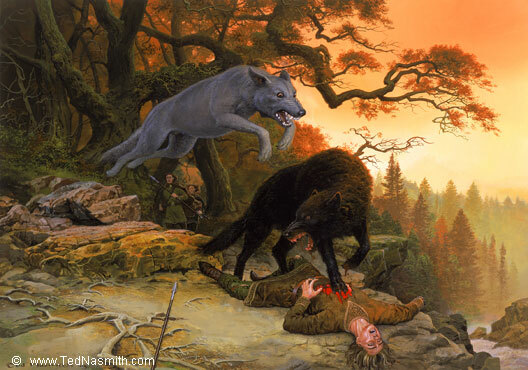 Once Beren and Lúthien had succeeded in obtaining the Silmaril (though Beren had lost his hand to the wolf Carcharoth in the process), Huan joined with Beren, Beleg, Thingol, and Mablung in the Hunting of the Wolf, where he fought Carcharoth, the greatest Wolf of all, as prophesied; and though he slew the Wolf of Angband, Huan himself was mortally wounded in the battle. In his life, Huan only spoke three times: once each to Beren and Lúthien in advisement, and once more to bid farewell to Beren.